New Year, for me, was always something that instantly began at 00:01 on January 1st. That was until a number of years ago when HarperCollins Canada created the 50 Book Pledge. Ever since I learned about it, I have taken part and I don't really feel like the New Year has begun until the pledge is launched for another year. This year it was double the delight! Not only have HarperCollins Canada launched the 50 Book Pledge again, but they have also, with the help of John Caruso, launched a web app in which the reader can add books to shelves (read, and to-read) and even customize their pledge. I have opted to really go all out on it this year and selected their highest pledge of 200 books, each of which I'll be reviewing here on The Literary Word. 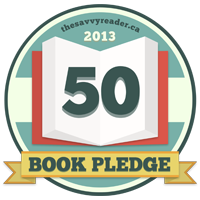 If you'd like to learn more about the 50 Book Pledge, you can check out the information for it at The Savvy Reader. There you'll find all the resources regarding ways to participate, including the twibbon site http://twibbon.com/support/50bookpledge-2013 where you can update your Facebook and Twitter profiles with the 2013 Pledge badge. Woah, 200 books? Have fun reading! I certainly have enough book ideas. I just peeked at your blogs and talk about brain candy! I look forward to following your progress through the year.